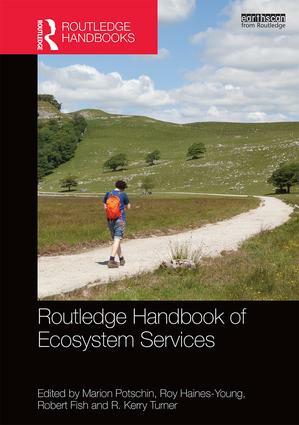 The Routledge Handbook of Ecosystem Services, published in 2016. Potschin, M.; R. Haines-Young, R. Fish and K. Turner (2016): Ecosystem Services in the twenty-first century. In: Potschin, M., Haines-Young, R., Fish, R. and Turner, R.K. (eds) Routledge Handbook of Ecosystem Services. Routledge, London and New York, p. 1-10. Potschin, M. and R. Haines-Young (2016): Defining and measuring ecosystem services. In: Potschin, M., Haines-Young, R., Fish, R. and Turner, R.K. (eds) Routledge Handbook of Ecosystem Services. Routledge, London and New York, p.25-44. Potschin, M. and R. Haines-Young (2016): Frameworks for ecosystem assessments. In: Potschin, M., Haines-Young, R., Fish, R. and Turner, R.K. (eds) Routledge Handbook of Ecosystem Services. Routledge, London and New York, p. 125-143. Fish, R.; Potschin, M.; Turner, R.K. and R. Haines-Young (2016): Ecosystem services: Never waste the opportunity offered by a good crisis. In: Potschin, M., Haines-Young, R., Fish, R. and Turner, R.K. (eds) Routledge Handbook of Ecosystem Services. Routledge, London and New York, p. 606-610. Primmer, E., Jokinen, P., Blicharska, M., Barton, D.N., Bugter, R. and M. Potschin (2015): A framework for empirical analysis of ecosystem services governance. Ecosystem Services 16: 158-166. Furman, E. and M. Potschin (2015): Nature-Based Solutions. OpenNESS Policy Brief No 2. OpenNESS Policy Brief no 2. Palacios-Agundez, I., Onaindia, M., Potschin, M., Tratalos, J., Madariaga, J. and R. Haines-Young: Relevance for decision making of spatial explicit, participatory scenarios for ecosystem services in an area of a high current demand. Environmental Science and Policy 54: 199-209. Haines-Young, R.; Tratalos, J.; Potschin, M. and M. Everard (2014): Scenarios research under the UK NEAFO. Environmental Scientist, December 2014 : 43-49. Potschin, M. and K. Jax (2015) (eds. ): Ecosystem Service Reference book. Online. Jones, L. …. Haines-Young, R. et al. (2013): A review and application of the evidence for nitrogen impacts on ecosystem services. Ecosystem Services. Online. Haines-Young, R. and M. Potschin (2014): The Ecosystem Approach as a framework for understanding knowledge utilisation. Environment and Planning C: Government and Policy 32(2): 301-319. Jax, K.; … Haines-Young, R.; … Potschin, M. et al. (2013): Ecosystem services and ethics. Ecological Economics. 93: 260-268. Palomo, I.; Martín-López, B.; Potschin, M.; Haines-Young, R. and C. Montes (2013): National Parks, buffer zones and surrounding landscape: Mapping ecosystem services flows. Ecosystem Services 4: 104-116. Potschin, M. and R. Haines-Young (2013): Landscape and the place-based analysis of Ecosystem Services. Landscape Ecology 28: 1053-1065. Luck, G.W. ; Chan, K.M.A. ; Eser, U.; Gomez-Baggethun, E.; Norton, B. and M. Potschin (2012): Ethical Considerations in On-Ground Applications of the Ecosystem Service Concept. BioScience 62(12): 1020-1029. Burkhard, B.; de Groot, R.; Costanza, R.; Seppelt, R.; Jørgenses, S.E. and M. Potschin (2012): Solutions for Sustaining Natural Capital and Ecosystem Services. Ecological Indicators 21: 1-6. Howard, B.M. ; Hails, R.S. ; Watt, A.; Potschin, M. and R. Haines-Young (2011): Considerations in environmental science and management for the design of natural asset checks in public policy appraisal. Paper presented at a workshop hosted by Defra, 11th May 2011. Defra Project Code NE0122. De Groot, R.; Costanza, R.; van den Broeck, D.; Aronson, J.; Burkhard, B.; Gomez-Baggethun, B.; Haines-Young, R.; Kubiszewski, I.; Müller, F.; Petrosillo, I.; Potschin,M. ; van der Ploeg, S. and G. Zurlini (2011): A Global Partnership for Ecosystem Services. Solutions 2(6): 42-43. Potschin, M. and R. Haines-Young (2011): Introduction to the special issue. Progress in Physical Geography 35(5): 571-574. Potschin, M. and R. Haines-Young (2011): Ecosystem Services: Exploring a geographical perspective. Progress in Physical Geography 35(5): 575-594. Haines-Young, R. (2011): Exploring ecosystem service issues across diverse knowledge domains using Bayesian Belief Networks. Progress in Physical Geography 35(5): 681-699. Fitter, A.; Elmqvist, T.; Haines-Young, R.; Potschin, M.; Rinaldo, A.; Setäla, H.; Stoll-Kleemann, S.; Zobel M and J. Murlis (2010): An Assessment of Ecosystem Services and Biodiversity in Europe. In: Ecosystem Services (edited by Hester, R.E. and R.M. Harrison). Issues in Environmental Science and Technology, 30: 1-28, Royal Society of Chemistry. Haines-Young, R. and M. Potschin (2010): The links between biodiversity, ecosystem services and human well-being. In: Raffaelli, D.G & C.L.J. Frid (eds. ): Ecosystem Ecology: A New Synthesis. Cambridge University Press, British Ecological Society, pp. 110-139. EEA (2010): Ecosystem Accounting and the Cost of Biodiversity Losses: The Case of Coastal Mediterranean Wetlands. Edited by Haines-Young, R.; Potschin, M.; Kumar, P. and J. L. Weber. EEA Technical Report No3/2010. Royal Society (2009): Ecosystem Services and biodiversity in Europe: building science into policy at EU level. EASAC Policy Report 09. With Contributions from M. Potschin and R. Haines-Young, Annex 1, p. 33-65. Kienast, F.; Bolliger, J.; Potschin, M.; deGroot, R.S. ; Verburg, P.H. ; Wascher, W. and R. Haines-Young (2009): Assessing landscape functions at the continental scale: a methodological framework. Environmental Management. 44:1099-1120. Haines-Young, R (2009): Land Use and Biodiversity Relationships. Land Use Policy, 26(1): S178-S186. Potschin, M. (2009): Land use and the state of the natural environment. Land Use Policy. 26(1): S170-S177. Haines-Young, R.; Fish, R. (2009): Hypothesis Testing. In: Kitchen, R. & Trift, N. (eds): International Encyclopaedia of Human Geography, Vol 5: 264-270. Oxford: Elsevier. Haines-Young, R.; Langanke, T. and M. Potschin (2007): Landscape character as a framework for environmental assessment. – In: Petrosillo I., Müller, F., Jones K.B., Zurlini, G., Krauze K., Victorov, S., Li, B.-L. and Kepner G.W. (eds. ): Use of Landscape Sciences for the Assessment of Environmental Security. Springer, p. 165-174. Potschin, M. and R. Haines-Young (2008): Sustainability Impact Assessments: Limits, Thresholds and the Sustainability Choice Space. In: Helming, K.; Tabbush, P. and M. Perez-Soba (Eds): Sustainability Impact Assessment of Land Use Policies. Springer. Potschin, M. and R. Haines-Young (2006): ‘Rio + 10’, sustainability science and the landscape agenda. Landscape and Urban Planning 75(3-4): 162-174. Haines-Young, R. Watkins, C.; Wale, C. and A Murdock (2006): Modelling natural capital: The case of Landscape Restoration on the South Downs, Landscape and Urban Planning 75(3-4): 244-264. Potschin, M. and R. Haines-Young (2003): Improving the quality of environmental assessments using the concept of Natural Capital: a case study from Southern Germany, Landscape and Urban Planning, 63: 93-108. Haines-Young, R. and M. Chopping (1996): Quantifying landscape structure: a review of landscape indices and their application to forested landscapes. Progress in Physical Geography 20(4): 418-445.